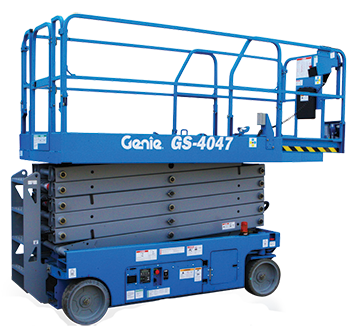 Demand for the Genie GS-4047 scissor lift has been so strong across the globe, that the 1000th unit rolled off the production line in the UK, less than 18 months after the production began. The GS-4047 is a compact, self propelled scissor lift which reaches a height of almost 14 metres. The success of the GS-4047 scissor lift both in Australia and throughout the world, is testimony to Genie engineers responding to market needs. The GS-4047 model brings together all the benefits of a compact machine, increased working height and powerful lift capability to perform jobs in confined spaces. With front-wheel drive and zero inside turning radius, combined with a compact footprint of just 2.49 m long and 1.19 m wide, the GS-4047 lift is ideal for manoeuvring around tight restrictive work environments. This model has been specifically designed for use in lofty spaces where access is very tight. The Australian market has fully embraced the GS-4047 scissor lift with units operating in warehouses and tilt up construction sites across the nation.